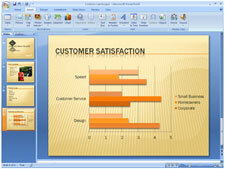 Microsoft Office Standard 2007 offers the core Microsoft Office applications, but significantly updated for faster, better results. Comprised of Excel, Word, PowerPoint, and Outlook, this software suite empowers you to create high-quality documents and presentations, build powerful spreadsheets, and manage your e-mail messages, calendar, and contacts. 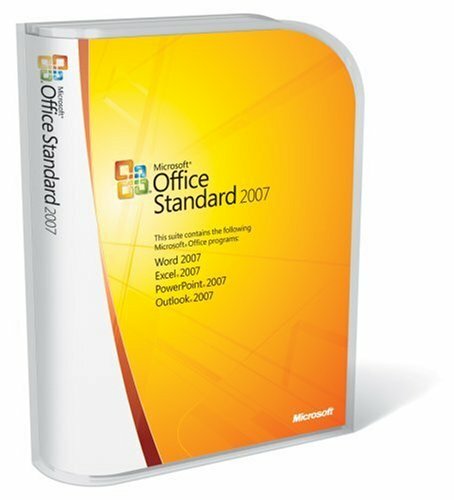 With improved menus and tools, enhanced graphics and formatting capabilities, new time and communication management tools, and more reliability and security, Office Standard 2007 makes it easier and more enjoyable for you to get things done at home or work. Many of the most valuable features in previous versions of Office were not about the document authoring experience and instead focused on all the things you can do with a document: share it, protect it, print it, publish it, and send it. Although this focus had its advantages, previous releases lacked a single central location where a user could see all of these capabilities in one place. 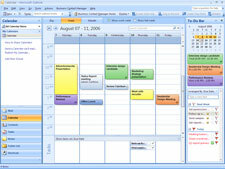 Office Standard 2007's new interface, however, bring together the capabilities of the Office system into a single entry point: the Microsoft Office button. This button allows for two major advantages. First, it helps users find these valuable features. Second, it simplifies the authoring process by allowing the Ribbon to focus on creating great documents. Waste of money? Um, yeah. It appears what happened was someone sitting around the old Microsoft Offices said "Hey, I got a great idea! Let's make Office look really pretty! We may have to take away some of the functionality, but hey, it will look great!" My problem is I need tools such as a workhorse spreadsheet program, a powerful word processor, a flexible database, and stunning presentation program to successfully complete my job. Upon purchasing Office 2007, I was expecting expanded features and functions to assist me in doing so, just like every update had previously provided me. Instead I found myself with a redesigned interface (which takes time to learn) and an actual reduction of features from Office 2003 (which Microsoft freely admits occurred, because they couldn't fit a few of the features into the new interface). So what you are in fact spending your hard earned money on is a group of programs designed to look really good (with neato 3D graphics, wow! ), but at the expense of taking away your tools rather than expanding them. While I personally use WordPerfect Suite 8, the best office suite ever programmed, for reports and writing projects, I keep a version of Microsoft Office to be compatible with my clients, and for Outlook and PowerPoint (both of which are decent programs). I decided with my new computers to move up from Office 2000 to the current version. I wish now I had bought Office 2003. Each component of Office 2007 is slow to load, slow to respond, just plain slow to do anything. The interface in not intuitive and I have to search for the old familiar functions. I am using XP Pro, so that may be an issue regarding startup speed, and yes, the computer hardware in a few years will improve to the point even this dog will appear fast. Being a user of WordPerfect since 1985 and WordPerfect Office since its beginning I have encountered "improved" suites for both Word and WordPerfect office that actually were less functional and more buggy than the predecessor. The new programmers, using the latest and greatest programming language and methods, think that they have produced the be all and end all version, with latest jazzy snazzy interface. (This applies to WordPerfect office as well, which is why I use the Win95 era Version 8 rather than the latest.) But often they produce abominations, such as Office 2007. So buyer beware, it is indeed a dog, at least when using XP Pro, and an ugly dog at that (considering the interface). If I hadn't already spent the money, I would give OpenOffice another try. The "user experience" surely cannot be worse, and may even be better ... and it is certainly not overpriced. Last, I really have to wonder ... do the people that develop and oversee these software projects actually use their own product ... I mean rigorously use the software. If so, how could they let such products ship? Or does Microsoft simply not care, since they virtually own the market. I didn't want this software, but as Office 2000 was no longer supported, I had to upgrade. Office 2007 is hard to navigate; I can't find much of the items I want; it is not user friendly and I wish I still had 2000. Like Vista, they took a great system and made it harder to use and confusing. Nothing is where it was, so finding what I want is frustrating. Why can't they leave a good system alone? I know that I give this office 5 stars because I never used the older versions that the other reviewers did. I did have to take the tutorials. I have really enjoyed the office and it has been a great learning experience. Other reviewers that gave the Office low scores were the ones that had the older version. They had a lot of changes and a lot of new things to learn which they did not enjoy. I can say that if you never used any other version of office you will enjoy the 2007 full version. You do have to take the tutorials to get the full benefits of the office. I have been using the office for all most 2 months at the end of August. It takes about a week to get familiar with the new menus of Office 2007. But the new features of Office are worth it. Word can now save your document to PDF without purchasing Acrobat as a separate install. 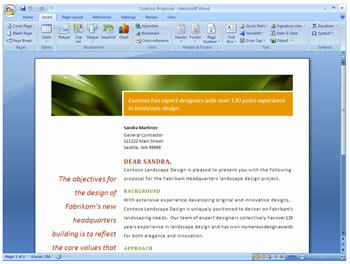 Word allows you to visually preview a style on a section or paragraph of your document before you permanently apply it. Great for designing on-the-fly layouts. Print quality of a document seems to be a lot snazzier making it look like I had a professional layout artist add finishing touches. Importing Excel tables into Acces is a lot faster and more intuitive. I receive business data from our agents which I move into Access before loading into SQL Server 2005. Yup, Access is my Swiss knife-of-choice to handle normalizing all forms of biz info before uploading into SQL server. All these tools work flawlessly in our Vista professional environment. And if you're like me who's worked over 20 years on Wall Street, accurate data and effective communication is priceless. When I recived this software I immediately became suspicious because the disk did not contain any holographs or other security items. I logged on to the Microsoft website and looked at their ways to detect if software is legal. This disk obviously was not a licensed copy of Office 07. I contacted DigitalAge and Amazon about the problem. I never heard from DigitalAge, but Amazon immediately refunded the amount I paid to my credit card account. I asked Amazon if they wanted me to return the disk but they instructed me to destroy it. The rating star system above made me select at least one star. My real opinion is "NO STARS!" In Office 2007, Microsoft has apparently decided that the idea of menus is outdated, so they've eliminated them and replaced them with the "ribbon". While at first this seems easier to use, it will require you to relearn how to do everything in Office. Want to insert a cross reference in Word? Hmm, well, I used to do that using the menus, now I have to hunt through all the annoying ribbon items to see if I can figure out where they've moved it. Plus, unlike the menus, you have no ability to determine what the shortcut key is. Maybe I can search for it in the help system. Searching for "insert cross reference" returns no useful hits. (Although it does seem to be quite good at finding information about templates which I never use). How is it that they can make help so useless?? Plus, if you don't like the ribbon, there's no way of configuring it to use menus instead. You're stuck with it. I commend Microsoft for attempting to increase usability, but this new feature certainly doesn't make me any more productive. It seems to be change for the sake of change. If you're thinking of upgrading or buying this new, keep in mind that you'll essentially have to relearn how to use each application. Things that you've known how to do for years will now be useless. I would like to know which genius came up with this little gem. This must be the worst "update" of a software in history. As I was forced to buy a new computer, I was "blessed" with this malady of a software. Despite the appealing first impression - the new Office presents itself with a modern and colorful layout, the debilitating flaws become all too quickly obvious once one starts to work with it. The new feature, the Ribbon, is one of those things that look good only on paper. (like those state-of-the-art kitchen which are designed by very smart men, designers, engineers... but alas no cooks...) If you, like me, are one of those frequent users who work with the software on a daily basis, are very familiar with all its features and value the option of customizing your settings and toolbars in order to streamline (=timesaving) your individual processes, you are in for a major disappointment. The Ribbon is static - no customizing. Microsoft allegedly surveyed thousands of users and put the most popular features in so-called groups on this Ribbon. Great, if you are one of those surveyed users - a nightmare, if you were taking full advantage of individualizing (=streamlining) features. It is sort of like having a closet full of nice clothes, and then a survey shows that "gray goes with everything" and we are all stuck with the same gray clothes. Instead of doing my work, I spent hours searching for features that are now hidden, moved, or simply do not exist anymore. I have been cursing at my screen, for hours. And I am getting more and more irritated as I am looking at my work which wants to be done. Now, don't get me wrong, I am all for innovation, but not for innovation's sake. And I don't mind at all learning new things, if they prove to, in fact, improve things. And nope, there was not one "new thing" that made me say "ah, now that's a great improvement." It took me about a week to get up to speed, and then I found that when I completed work and sent it out, it was not compatible with the older Microsoft systems in use at these companies! BUT ... it was super easy to "save as" and make a copy that was compatible. 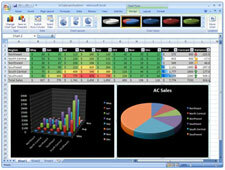 I've been very happy with this 2007 version of the Microsoft Office. Received it on time, works like a dream Love it! This is truly the best version of Office yet. It is much more faster and much more stable than any version. The new Ribbon interface makes everything nice and easy to find. No more digging through all the annoying nested menus. You want formatting options, click the formatting tab. All the formatting possibilities are there.